What a phenomenal website!!! The prices are so great, they are just amazing!!! Just booked round-trip to Miami for $109, you just cannot beat the prices!!!! 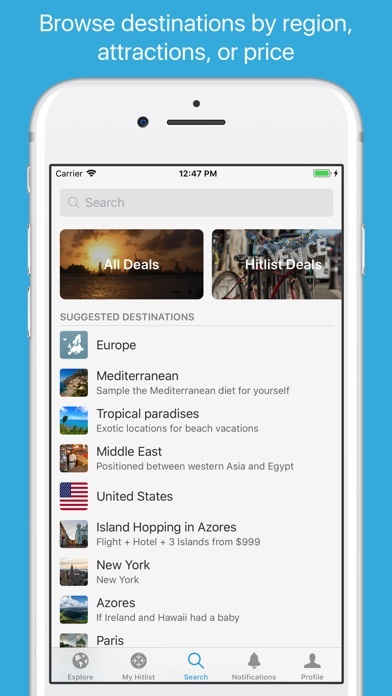 If you are interested in an app that promotes a travel deal and when you click through the deal is “ no longer available” then this is the perfect app for you. If you seek out disappointment then this is the app for you. If you want to get your hopes up and then have them dashed then download this and click away! It seems that no matter when I receive an alert or search for a flight. There’s never any flights available. Seems like a fake app that tries to get you to pay a premium to actually use. I accidentally purchased the app and have tried to email Hitlist several times to refund my $18 that they charged me. They refuse to respond. Also, the flights are fake and usually not available. It’s not a good app. Do not waste your time. Every single flight listed on the explore page says “We’re sorry, this deal is not available anymore”. EVERY. SINGLE. ONE that i clicked on. And that’s after waiting more than a minute for it to load. This may be due to how the “spectacular” prices listed are just too good to be true. New to the app. I love getting to see great fares to places I want to go. As an empty nester, I have much more flexibility these days! Can’t wait to pull the trigger on a fun getaway! Very disappointed. All was going nicely in choosing flights, til I tried to hit the BOOK button. Nothing would happen. So I hit “Send me a reminder” which sent me an email link of the flights I wanted. I opened that email and clicked that link and got to a page with my trip info but, again, no way to seal the deal and actually book it. So I just used Google flights, which I have always had good luck with. 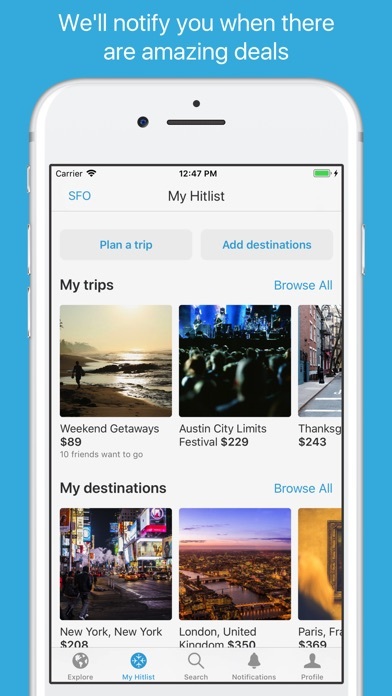 I never leave reviews for apps, but HitList is amazing! 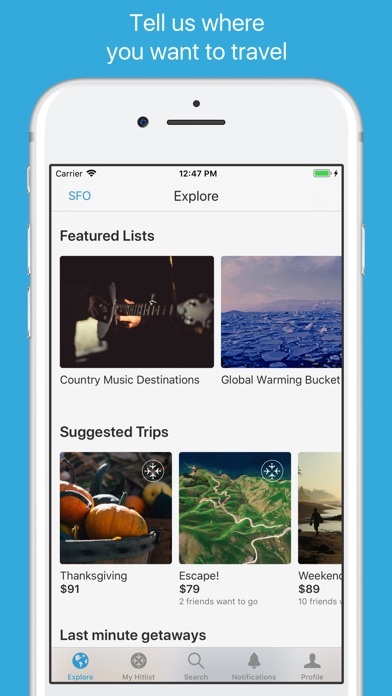 Props to the whole team, and from one developer to another this is a super well-coded app! Subscribing to the premium soon. Thank you guys. Cool app, some great deals.... but pesters you for reviews. Bugged me three times within a minute of launching it. Great idea but I just went through about 30 suggested deals and 25 were no longer available. 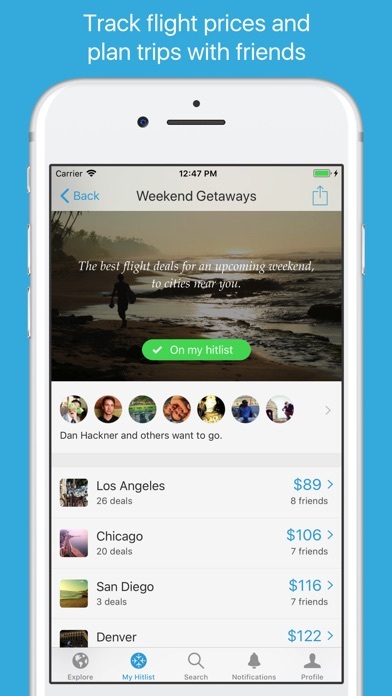 If you want to use an app to find deals and buy flights fast, this isn’t the one. Developers can’t keep up with 80% of the deals advertised that are worth the purchase.